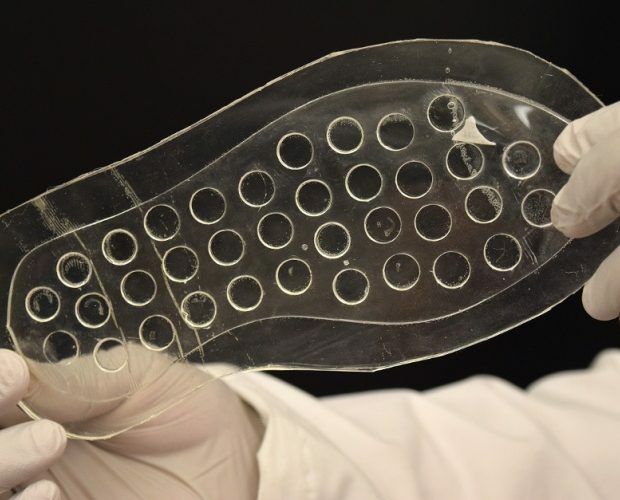 A new show insole has been developed by Purdue University in order to help prevent amputation of toes, feet and legs of diabetics who are currently suffering from diabetic ulcers. The insoles have been designed to slowly release oxygen to the foot, which in turn heals the ulcers and allows the user to be able to regain more mobility. Diabetic ulcers are caused by damaged nerves which causes skin tissue to disintegrate as well as the lack of feeling, meaning that damage to the foot can go unnoticed, and therefore doesn’t receive the appropriate treatment. “We typically treat ulcers by removing devitalised tissue from the surface of the wound, and by helping the patient to find ways to take the weight off the affected foot,” said Desmond Bell, a podiatrist in wound management and amputation prevention at the Memorial Hospital in Jacksonville, Florida, and the founder of the Save a Leg, Save a Life Foundation. Designed primarily for users between 53-81kg, the new insole if fully customisable, and can be custom created for users of all weights. The next step in this discovery is finding a way to 3D print the entire insole at once, rather than using a laser printer and a mould.